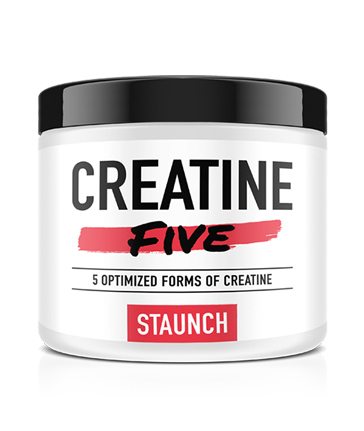 Staunch Creatine Five is the blend of creatine that you’ve always wanted, but never quite known it. Why, you ask? Well, because creatine is such an exceptionally helpful tripeptide, and also because each 6 gram scoop of Staunch Creatine Five provides you with 2,000mg of Magnesium Creatine Chelate, which is a highly bioavailable mineral creatine complex. This specialised complex ensures that the important mineral magnesium is delivered to you, which so many of us are deficient in. In fact, approximately 50% of men and 39% of women consume less than the RDI for magnesium each day, which is the minimum amount of this mineral required to prevent deficiency diseases1. Magnesium helps muscles to relax, preventing muscular twitches, spasms and cramps, and aids in blood flow to muscle mass for enhanced recovery. Furthermore, Staunch Creatine Five contains malic acid, in the form of ti-creatine malate and pure malic acid. Malic acid is a constituent of the citric acid cycle, and therefore supports NADH and FADH2 generation, important constituents for the synthesis of ATP, the universal energy source. Creatine is a tripeptide, which means that it is composed of three amino acids linked together. These are methionine, arginine and glycine. It is stored in muscle tissue as phosphocreatiine, where it donates phosphorus for the rebuilding of ADP back up to ATP. This is the primary energy pathway for explosive exercises, like sprinting and lifting, and is said to benefit movements of exercises that last up to three minutes2. Creatine has also been identified as being helpful for supporting recovery between sets, and even boosting intelligence and working memory 3,4. Can’t argue with that! Staunch Creatine Five contains five unique forms of creatine and is the perfect addition to any serious explosive trainer or bodybuilder’s supplementation program. Add 1 scoop (6g) to cold water, pre-workout, intra-workout or protein shake and consume.